This is a story of a remarkable friendship between two persons hailing from opposite ends of the Indian Subcontinent, I from Kerala in South India and Sudhir Choudhary from the Northern most part of India, Jammu. 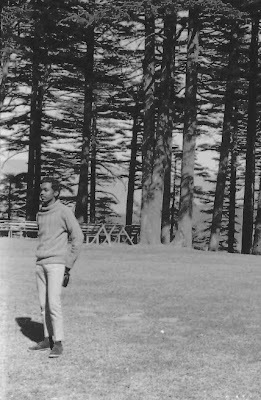 Though Sudhir was my junior by a year in Motion Picture Photography we became good friends very soon. Whenever he returned from his home in Jammu after holidays, he used to bring a sack full of dry fruits like almonds, pistachios etc and distribute it amongst his friends. Handsome looking and debonair, Sudhir can be usually found in the company of acting students. While in his second year he wanted to buy a 16mm camera, preferably a Bolex reflex for his personal use and found that a few used cameras were available at Delhi. Being a senior student he sought my advice regarding the choice of camera and wanted me to go with him to Delhi for testing the cameras before buying and to do the selection. Since it was Christmas vacation time I readily agreed. So we left for Bombay by train and were joined there by Romesh Sharma and M.S. Sandhu ( Both from Acting) and Nitin Mukesh (son of legendary playback singer Mukesh). We all flew from Bombay to Delhi by an Indian Airlines flight. That was my first ever air travel and my ticket amount (we were entitled to student concession) was borne by Sudhir himself. On reaching Delhi we stayed at a house belonging to Mukesh’s family. Myself and Sudhir went to various dealers and found three or four Bolex cameras both non-reflex and reflex ones. We tested the lenses and checked the camera body and movement for any flaws. Finally we settled on a Reflex model camera in good condition and at a reasonable price. We also purchased a few 100 ft rolls of 16 mm Kodachrome reversal film for testing and for Sudhir’s personal use. From Delhi along with Sandhu, Sudhir and I proceeded to Chandigarh and did a bit of sight seeing of the well planned and designed city for a day. Sandhu took leave and we both left for Shimla, where Sudhir’s sister was studying at that time and he wanted to meet her. It was the month of December and was quite cold in the evening and we warmed ourselves with some gimlet and nice sizzlers at a bar. To pass time we went to see a John Wayne Western film running in a nearby theatre though we both had seen the film much earlier at Poona. The show started around 5.30 PM and only a handful of persons were in the audience. But the show ended abruptly by 6.45 PM as one or two reels in between were not screened. Since we had seen the film earlier we demanded an explanation from the theatre manager. He admitted that the Projector operator had done a little bit of “Editing” so that he can finish the show and go home early as they don’t have any night shows in winter. The manager apologized and offered to refund the ticket amount but we didn't take it and being Cinema students we gave a stern warning to him not to chop a creative work according to their whims and fancies in future. Next day we met Sudhir’s sister and left for Jammu and reached Sudhir’s home for a warm welcome. 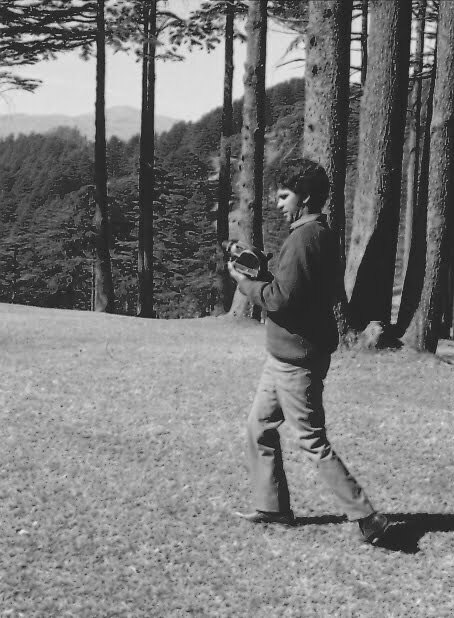 His father had a nice Cinema theatre in Jammu which was an artistically built building with lots of curving ramps. They were also having a logging business in a mountainous forest area from where they supplied wooden sleepers for the Indian railways. Their camp was situated deep in the forest, a few hours drive from Jammu. Sudhir and I planned to go there and try our newly acquired camera to shoot a short documentary on the subject of sleeper making. The ride in the jeep through the mountain roads was a hair rising experience especially if you are seated on the side of the jeep. Beside the wheel you can see only inches of solid ground and then the deep ravine with the river flowing deep in the distance as the jeep is driven at breakneck speed. Of course the drivers are expert persons knowing the winding roads just as the back of their hands but persons new to these places like me are bound to get frightened. At last we reached a place where the road ended and then it was a long trek up the hill and through the dense forest. It had also some exciting moments such as walking at the edge of the mountain and crossing deep ravines walking on fallen trees by balancing like a tightrope walker.We reached the camp situated at a picturesque location surrounded by tall trees. The tents were comfortable to stay with all necessary requirements but the nights were quite cold, which we warmed up with a few drinks around a camp fire and enjoying the nice food prepared by the staff. The entire operation of producing the wooden sleepers was done there in the deep forests. First the big trees were felled and then using machines they were sawed in to sleeper sized pieces. The sleepers were transported by a unique method by using the force of water flowing there. 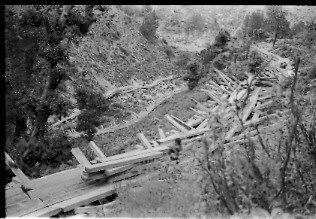 A specially built channel winding down the mountain is constructed using wooden sleepers and the water from the river is diverted through it. The cut sleepers are then floated down to their destination easily by the swift moving water. Sudhir with his newly acquired Bolex went around and we filmed the entire procedure of making wooden sleepers, right from felling of the trees, cutting it to sleeper size and transporting it down to the plains etc. We spent a few days in those sylvan surroundings exploring the forest and filming the activities. It was time to return back to Jammu. There I enjoyed a few days of great hospitality at his home with fine food mixed with affection. I took leave from their lovely family.The smell of pure Basmati rice still lingers on in my mind. Nowadays you don't get that kind of rice any more! The return trip was by train and Since Sudhir wanted to stay home for a few more days, his father had asked the manager to book a ticket for me to Bombay. When I arrived at the Pathankot Railway station I was handed a First Air-conditioned class ticket and I was allotted a separate Coupe in the compartment. The manager said there was no vacancy in First class due to holiday season rush and only First A/C was available.It was really a luxury in those days and only very rich people traveled in First A/C class as it was more expensive than even air travel.There were only a handful of passengers and the compartment was practically empty through the journey. I was alone in the coupe till I reached Bombay with occasional intrusion by often pampering liveried waiters seeking orders for food and beverages. To fight the boredom of the two days of traveling alone, I started writing a long interesting letter to my father about my trip. Finally I reached Bombay and then went to Poona. After passing out from the Institute, once in a while we used to correspond with each other but the link got broken sometime. I lost his address and could not contact him either for a long time. But sometime back I managed to get his phone number from his batch mate Anil Jain from Delhi whom I also got in touch after many years through the net. I phoned up Sudhir and had a long chat after so many years. He is planning to visit Kerala in the near future and I hope to meet him once again to strengthen the bonds of Friendship!